The Advertising Specialty Institute® (ASI) today announced voting is now open for the Advantages® Product Video Contest, designed like a March Madness bracket to select the industry’s most popular video in weekly head-to-head competitions. For the contest, supplier and distributor companies throughout the $22.9 billion promotional products industry submitted their best product videos. During the month of March, anyone can vote in the bracket showdown, designed like the NCAA March Madness tournament. The videos, most of which are less than a minute long, run the gamut, from funny and smart to colorful and kooky. Each week, viewers vote for their favorite in each matchup, with voting ending on Fridays at 12 p.m. EST, and the winner moves on to face the winner of another matchup in the next week. The voting continues throughout March, with the field whittling down until the contest crowns a single champion. The winning video will be announced across ASI’s social media pages. 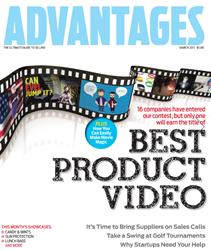 The winning company will also be featured in the May issue of Advantages magazine, the industry’s leading publication for distributor salespeople, featuring tips and tactics for sales success along with the latest products. For more information on Advantages magazine, contact C.J. Mittica at cmittica(at)asicentral.com. For information on advertising in any of ASI’s four award-winning magazines, contact ASI’s Matthew Barnes at mbarnes(at)asicentral.com. The Advertising Specialty Institute (ASI®) serves a network of 23,500 suppliers, distributors and decorators in the $23 billion promotional products industry. ASI’s flagship product, the technology platform ESP®, manages the industry’s entire supply and marketing chain. ASI also produces award-winning digital and print content, live events and educational programs that enable companies in 61 countries to be more efficient, productive and profitable. ASI’s Counselor® magazine provides the most authoritative business content in the industry, and the ASI Certification Program features 500+ live and online education courses for over 40,000 professionals. The company, family owned and operated since 1962, is proud to have been consistently ranked among the “Best Places to Work” in Philadelphia and Bucks County, PA. For more info: http://www.asicentral.com.